2005 – Ephemeral installation of variable size comprising a notice board, cards printed with user’s guide, printed canvases and a complete audio system. 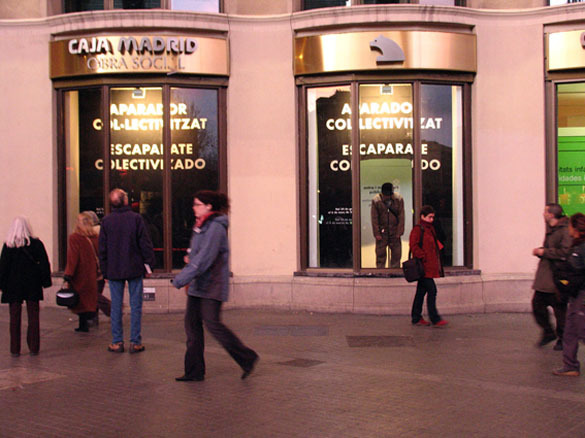 The project Corner offered the shop window of the Foundation Caja Madrid in Barcelona’s Plaça Catalunya, to be used for successive interventions adapting to the unique nature of the location. 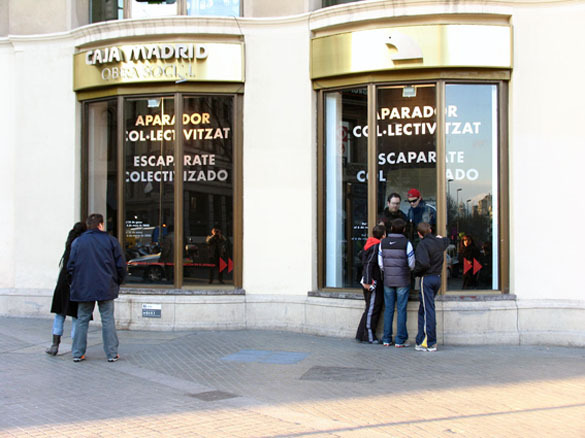 With Aparador Col.lectivitzat (Collective Shop Window) I proposed to socialise the shop window as an exhibition and publicising space. The goal was to share that space offered for my own use from the 24th of January until the 6th March. During this time everyone who wanted to, besides me, could make use of the shop window. 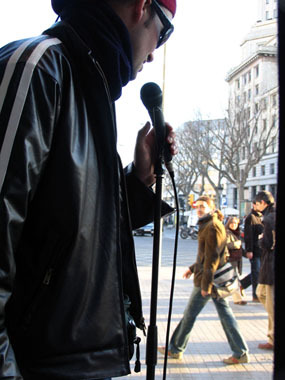 The private space of the shop window was transformed temporarily into public space, not only as a space of representation but as a space of action, where viewers could enter and use the services offered inside: proclaiming their ideas or explaining personal experiences through an audio system that amplified the voice outside, perhaps satisfying a curiosity to know what lies on the other side of the glass, or offering a moment of peace from the bustle of public space. All of this was accomplished without mediation, transforming the participants into beings directly responsible for their acts. The formal resolution of this genuine “speaker’s corner” was deliberately very simple and functional. 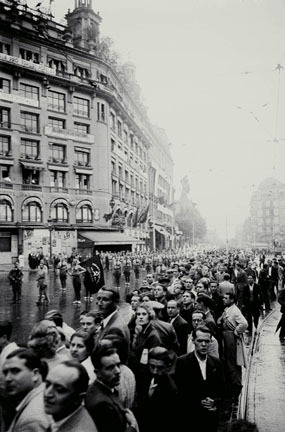 The shop windows were correctly identified as ” collectivised ” spaces, inviting the pedestrians to come to it, through serious signposting and with some “flyers” distributed around the area. 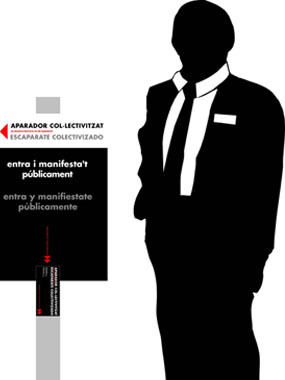 This proposal was a reaction to the growing privatization of the public space and the commercialisation of experience and was intended to generate a critique of the limits of the classical dichotomies of opposition between self and the other, inside and outside, private and public; and why not extend it to include the dichotomy between real and fictitious.